Cashel has a full line of utility sinks to meet any budget. 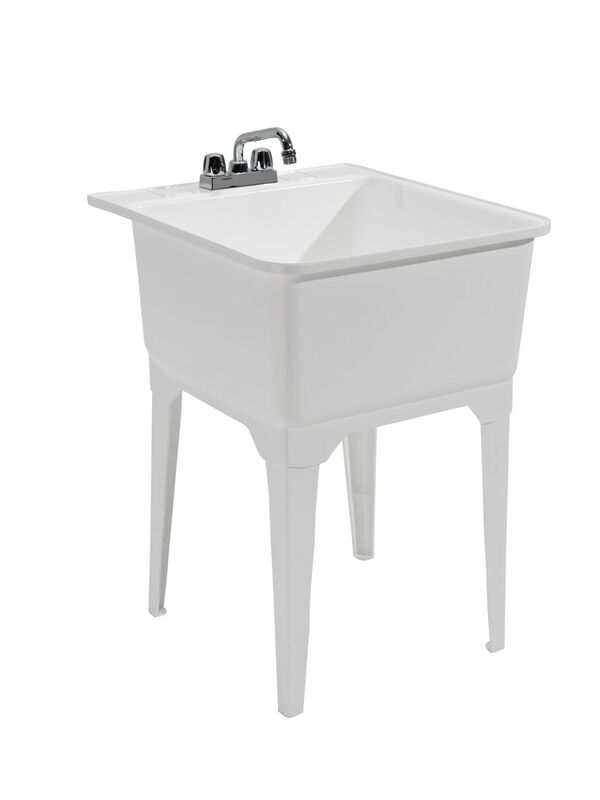 The Standard Sink provides the entry level choice in free standing laundry tubs. This utility sink is a quick, easy upgrade for any home remodeling project. The Standard Sink makes a great addition to your laundry or utility room. This utility tub easily fits in garages, greenhouses, pantries, and studios, too. Since it is great in all environs, the Standard Sink helps you conquer all jobs, large or small. Why the Standard Sink: Because the Standard Sink is made of sturdy polypropylene it is stain and rust resistant. 19 gallons is the maximum capacity of the durable basin. In addition, built-in self-draining soap dishes, make the Standard Sink the easy choice for your home or business. What comes with it: The Fully Loaded Sink Kit contains the tub, injection molded legs, leg levelers, and installation instructions. The kit also incudes a 4-inch chrome faucet, drain stopper, and strainer. The kit is complete with down plumbing and supply lines, too. Just bring a basic tool box; no special tools required!